Most of the MMA world was shocked when Shane Carwin was forced out of Saturday’s scrap against Roy Nelson (Pictured), but not “Big Country.” Nelson claims he was anticipating Carwin’s exit since the beginning because it has become somewhat of a routine for the former UFC interim heavyweight champion. From an injury standpoint, Carwin can’t seem to catch a break. The 37-year-old is coming off back-to-back back surgeries that nixed most of his 2012 campaign. He is now forced to rehab a blown knee. Carwin hasn’t been seen inside the Octagon since losing a unanimous decision to now-champ Junior dos Santos in a top contender contest at UFC 131 in June 2011. Nelson and Carwin were bitter rivals before serving as opposing coaches on “The Ultimate Fighter 16,” and their relationship didn’t get any better during their stint on the reality show. 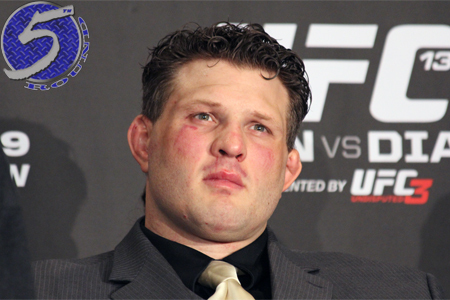 Nelson now faces Matt Mitrione in Saturday’s featured contest. He compares “Meathead” to a poor man’s Alistair Overeem. “The Ultimate Fighter 16 Finale” takes place inside The Joint at the Hard Rock Hotel in Las Vegas, Nevada.